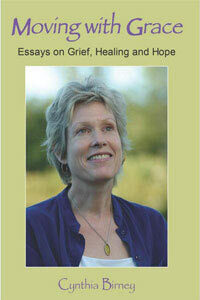 Cynthia’s book, Moving with Grace: Essays on Grief, Healing and Hope, is available at Amazon. Moving With Grace is a must-read for everyone who has ever squinted to find light at the end of the existential tunnel. In 25 vivid essays, Cynthia Birney unflinchingly excavates the devastating rupture of body and mind that unacknowledged grief had created in her life, then leads us with bracing clarity and sensitivity on an astonishing transformational journey back to mental, physical and spiritual health. She courageously addresses her pain as a path for healing, willing to watch each moment unfold with tenacious curiosity and determined to feel whatever arises, no matter how challenging. Think this sounds like a conventional recipe for happiness? This true story of a woman’s deeply felt re-integration of self will leave you breathless.